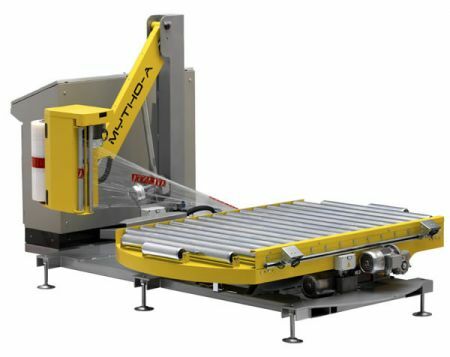 Due to the layout of the palletising cell it was not possible to supply new, empty, pallets to the robot directly so Atlanta included special software to allow stacks of new pallets to transit backwards into the cell for the robot to dispense individually. Atlanta were also able to offer the pallet wrapper painted in the same colours as the pallet conveyors making the whole installation look as well as operate as a complete unit. 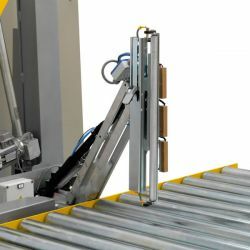 The automatic pallet stretch wrapper is the model Mytho A which uses the unique screw jack principle to raise and lower the film carriage. Whilst not required on this application, the Mytho A pallet stretch wrapper range can be equipped with a top sheet applicator if required, as shown in the alternative image. All machine parameters are adjustable, including, table rotation speed, bottom rounds, top rounds, speed up and speed down. The film carriage is equipped with power pre stretch film rollers to maximise the film yield per roll as well as increase load containment and improve the aesthetics of the wrapped load. To prevent unsightly film tails at the end of the cycle, the unit can be equipped with a film tail welding unit.